The Hotel Lungomare , 3 stars of Igea Marina facing the beach, has a fenced and free parking, WI-FI and free use of bicycles. Admits small animals. 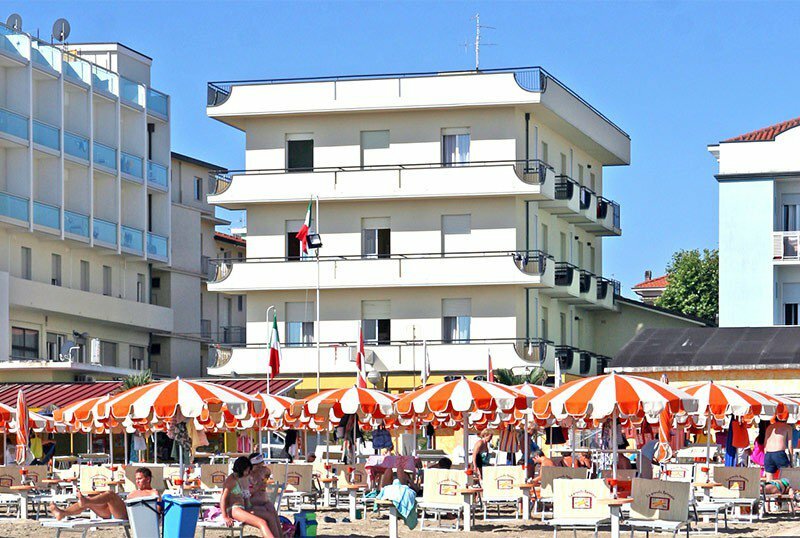 Hotel Lungomare is located in front of the beach in Igea Marina, directly overlooking the seafront. To reach the beach, simply cross the road. The rooms have a balcony overlooking the sea, LED TV, telephone, safe, private bathroom with shower, hairdryer and complimentary toiletries, air conditioning for a fee. Open-air porch, terrace, free use of bicycles, reading room, beach towel, theme nights, paid laundry. PARKING: uncovered, free at 300 meters. AIR CONDITIONING : free in public areas, payable in the room. CONVENTIONS : beach, gym on the beach. LUNCH AND DINNER : 3-choice menu with meat, fish and vegetarian dishes. At meals : baby food , high chairs. On the beach : playground, entertainment, mini club. The hotel has an agreement with "La grande spiaggia", with a playground, mini club, fitness area, entertainment, pedal boats and canoes.